Readers Digest of the last reddit QnA with Sub_Octavian and his team. For reasons of readability – and where the wording of question or answer allowed it – I shortened each question and answer. The full length posts can be found following the link to each question. If not noted otherwise, questions have been answered by Sub_Octavian directly. Are multiple questions presented in one post, I’ll link the source with the first question. Also I skipped questions regarding WV that Sub already answered (in this QnA – where in most cases he only answered: Replied above). Also: This with this QnA I wasn’t able to read along as the QnA happened on only got around to look at it, after it was already finished. So there’s a chance I might’ve missed a question. In case your question is missing, let me know and point me to it in the QnA. Question: Muting a players messages in a battle should also mute that players voice-commands? Answer: Sorry for not paying enough attention to this in the past. What you’re saying sounds perfectly reasonable to me and to a few other devs I shared it with. I will try to push it to the improvements list. Thank you! Question: What is the reasoning with naming the down tiered A hull of Colorado West Virginia and not Maryland? Everyone that has asked for West Virginia has been wanting the 1944 refit version, and not the old hull from Colorado. Any explanation would help a lot! Answer: There is no particular reasoning, just our plan to “fill the slot” with old fit version. However, we’re aware of the feedback like yours and right now are discussing how to proceed with the ship. Question: Port interface, option to dismount all current signals at once? Answer: I am really sorry, but I don’t have any updates on presets/mass operations yet. It’s certainly being considered, but that’s it for now. Question: Just a quick question, do you think WG will ever offer a server transfer service? Paid for of course. Answer: I really doubt that. The demand for now is too low for the costs it will involve, tbh. Question: With more and more content being added on the already sluggish UI, are work on fixing the underlying issue ongoing? Answer: Yes. However, I really doubt there ever will be one big fix to make it suddenly non-sluggish. However, several various improvements and optimisation fixes are being worked on. I understand it sounds like dodging response, but that’s how it its – we know it’s a problem, and working on resolving it, but cannot to it faster. Q(1/4): During the birthday streams you guys mentioned that you were working on 2 “prototypes” for radar 2.0. Can you shed some more light on those 2 diffrent prototypes? A(1/4): I won’t go to details right now (we will do it in Dev Blog when it’s time). But one is connected with the efficiency of team fire at the target spotted by radar and the other is connected with the ability/timing of such fire. So, we want to address mass focus fire issue with Radar for now, and would like to avoid changing it so hard it affects solo user experience. Ideally, a radar ship will not notice anything significant, but “boom, you’re spotted and your life is over” factor will be reduced. We will see if it’s enough though. Q(2/4): The sound Design team said, that they only have a limited amount of RAM which they can use. Which is quite understandable because we still have a 32bit Client. (which has normally 2GB max, 4GB if a certain setting is used). Any plans to advance to 64bit so that the Game Design teams have more freedom regarding RAM usage? We have a Ultra setting afterall which could be really Ultra then. A(2/4): WoWS already benefits from 64bit systems, and as for the sound, my colleague was referring to low settings mostly – this is where every mb of RAM literally counts. Q(4/4): Is there a reason why it is not possible to Lock on a target outside your firing range with your Main Battery like you can with torpedoes? Here an image to make it easier to understand which situation I mean. It’s obviously not as effective but I also think that this doesn#t trigger the “Incoming Fire Alert” and obviously not the priority target skill. Why not making it possible to lock on every target with your MB just like with Torpedo tubes? 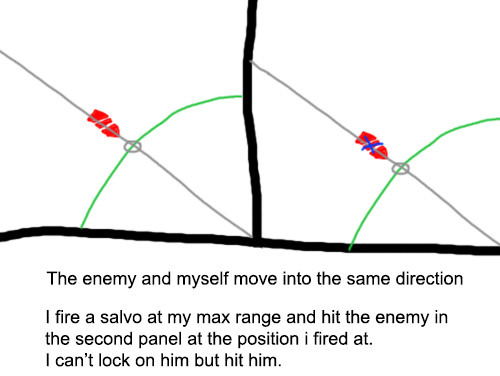 A(4/4): Basically, because it’s rarely needed, and while your case is true, in most other cases, the ability to lock beyond would just force ppl to try to shoot beyond their range. Q(1/20): Can we, by any chance, get the much requested select and mount/demount selection options for the signal flags menu? Q(2/20): Is it possible to display all means that are detecting a player’s ship at the same time (surface, radar, hydro, plane), and are there plans to implement it? Q(3/20): Can we have detailed post-battle stats for every individual player, like WoT and WoWp have already had for years? A(3/20): Yes, but it’s not a high priority. Q(4/20): How is work going regarding the new replay system? A(4/20): It’s going pretty slow, but it’s going. Some tech is even ready to be internally tested. Q(5/20): Are there any plans for a completely new UI (I believe I saw some kind of new UI in the CV rework demo), or are you going to stick to the current UI and keep optimising it? A(5/20): No – in CV rework you’ve seen placeholders. Q(6/20): Are there any plans for in-port tips for ships (e.g. pros, cons, role in battle, available consumables), more ships stats (sigma, HE penetration, AP penetration at 5, 10, 15km, more elaborate secondary battery stats) and tips for gaining XP? A(6/20): Yes, there are such plans, and my team has been working on some tip texts recently. Q(7/20): Any plans of making a more elaborate tutorial system? Seeing as many veteran players lack basic understanding of the game, I think this would improve the quality of gameplay for everyone. A(7/20): No, and we really doubt that a tutorial can get you that far in understanding the game. Q(8/20): Are there plans to move XP and credit gain away from damage into other equally impactful actions (spotting, tanking)? Also, are there plans to introduce XP gain for blocking caps, spotting torpedoes (not sure if this already exists) and assisted damage through smoke? A(8/20): No, no big re-balancing is planned, and blocking caps/spotting torps IS rewarded already. Q(9/20): Earlier this year there was a ballistics bug which allowed BBs to citadel each other left, right and centre. It was recieved very well by the playerbase and you said yourself that you would like to make BBs more punishable. Has there been any progress on that matter or has it been completely shelved? A(9/20): It was interesting, but still not healthy. Right now over population of BB is much less factor than it was. We do not plan global changes in that aspect. A(10/20): There is a new potent solution to be tested, which basically tells shells of particular caliber and higher to over penetrate particular plating. I hope, if it does the job and does not break anything, it can be delivered around 0.7.11-12. Q(11/20): Are there plans to remove or rebalance stock/alternative modules on T10 ships (stock aircraft and torps on some DDs such as Z-52 and Grozovoi, 457mm guns on the Conqueror which you said you were looking into)? A(11/20): No update here, sorry. Q(12/20): Are there plans to rebalance Udaloi and Ognevoi in a similar manner as Grozovoi, for the sake of branch consistency? Q(13/20): Are there any plans to give Khabarovsk some love? She is IMO fine in randoms, but in any sort of competitive there is no reason to pick her over any cruiser or DD. Q(14/20): How long will it take you to have an accurate statistical representation on the Worcester? Many will agree that ship in particular has greatly damaged the role of DDs in randoms, ranked and CBs. A(14/20): I am not sure, but a few months for custom ad hoc and probably up to year for avg stats. Q(15/20): Are there plans to remove random torpedo spread dispersion? Q(16/20): Are you working on Legendary upgrades for Salem, Stalingrad, Daring and Harugumo? How satisfied is the dev team with the currently available legendary upgrades? A(16/20): No, as with these upgrades there is no rush, and we’d like to see the real niche of each ship in meta before designing an upgrade. As for the current ones, there is very little data yet, but from what we have, we are happy. Q(17/20): Are there plans to rework/rebalance some captain skills before the CV rework hits live? A(17/20): Probably not before – rather when it hits. Q(18/20): Are there plans to rework cyclones (maybe to reduce detection range by a certain percentage instead of limiting the render range)? Also, can we get a timer that tells us when a cyclone will end? A(18/20): Not really, and there is a timer. Q(19/20): Have you considered any changes to the ranked batles system (for example, akin to the rating gain/loss system of CBs, or the chevron system such as in WoT)? A(19/20): No. We will not say that they are perfect, but we see that they work, and while I know they generate some salt, we’re not really aware of any ranked-based system with random MM in any game which does not. They are…an accomplished mode with strong fan base, and they will most likely stay. But, based on their design, there will be some experiments soon – like Ranked spring announced on Dev Blog. Q(20/20): Does the hydro range unification that was announced on the devblog today mean that German DDs will get German hydro range? And in what way does it affect the Loyang? A(20/20): Sorry, I’m on sick leave, and these changes came without my participation. I will look into it when I can. Answer: I will talk to the team when I’m back to the office, that’s an interesting question. Q(1/5): Is there a possibility of adding the Space Captain SFX + Voices to the Space Captains as part of both a “Space Event Voiceover” as well as part of “National+”? A(1/5): Yes, it sounds good. I made the request to audio team. Q(2/5): Slightly related, will you ever fix ARP Kirishima’s broken lines so that ARP Iona’s voice doesn’t sometimes play instead of Kirishima’s? I recall it’s mainly just minor coding issues, either capital K or lowercase k, as well as whether it has an Underscore or no space. A(2/5): As for ARP, I may have misunderstood your question, but as far as I know, we have only Kirishima “bear” lines, and Iona lines are played instead of normal Kirishima by design. Q(3/5): Concerning T6 West Virginia and T6 Mutsu, will you please reconsider them, and properly market them at T7 instead? A(3/5): I’ve already commented on WV above, as for the Mutsu, she’s in game, and there are no plans/need to change her dramatically. Q(4/5): Will Kii ever be buffed? Or is she destined to remain worse than Amagi in main gun performance and armor? A(4/5): Also, I will double-check Kii performance, but I don’t recall her needing a buff tbh. Q(5/5): In regards to Submarine experimentation, would Radar be able to detect snorkeled submarines? What about being spotted by planes, at least at snorkel/torpedo firing depth? And would underwater damage mechanics allow for possible damage on at least snorkeled submarines? A(5/5): The interaction between subs and other game mechanics, which is potentially possible in PvP, is not being worked on. Don’t rush it, my friend, it’s only Halloween for now. As for the underwater mechanics – technically an AP shell can damage a sub, as it would do with any underwater part of a surface ship. Question: I know this is old news at this point, but are you going to consider reworking Conqueror and the Royal Navy Battleship Line as a whole? Answer: Hey, thanks for making your point so detailed. I understand yout concept, but we do not plan to globally change the line. I believe we did learn the lesson from this release and we pay more attention to counterplay factor since then, but we do not have time or resources atm to rework this line, and also, it’s not something generally requested (yes, I know there ARE people unhapy about RN BB gameplay, not denying that). Q(1/4): will there be an opportunity to get the halloween perma-camos from the last years? I was totally digging the WH40k nurgle style Bismarck, however RNG wasnt nice to me. The bat Shokky also looked rad. Maybe via arsenal for coal (and please not as boxes )? A(1/4): Yes, we’re planning to re-introduce them. Q(2/4): T8 is regarded as being in a somewhat bad place for the matchmaker. It happens quite frequently of them being thrown into T10 matches. Are there plans to address this? Maybe indirectly by adding T11-12 battle tiers for the MM as WoT had, so you get T9-10 and T10 only matches. A(2/4): We would like to avoid T11-12, but we’re drawing some T10 away from random MM with additional endgame activities. Q(3/4): I think the legendary modules were a success in general, could these also be added to other tiers? Because why not. It is a nice incentive to go back to lower tiers for some fun boat matches. A(3/4): Not planned, because we don’t want to incentivise playing on lower tier the people who play on T10. Sorry, but why should we do it? Those who want to do it, do it already. A(4/4): The idea is nice, but we need to check with WEB team how difficult it is to implement. Question: Last time we heard anything about the Italian cruiser line, they were slated for Q4 2018. […] Is there anything new about them? Answer: Nope, as you know, the next line is RN DD, and beyond, I’m not leaking anything. But surely Regia Marina cruisers will arrive, and will take their rightful place in WoWs fleet. Q(2/5): With the CV revork, migh we see plane tenders being implemented as lower Tier CVs or as an alternative class? Q(3/5): Will the CV rework bring some kind of plane customisation? A(3/5): Most likely, yes, but maybe not from the 1st iteration. Q(4/5): With submarines becoming a possible part of WoWS not to end up lacking content to implement, might we see one day the appearence of support ships, monitors and pre-dreadnoughts (that would be actually fun to play, not like the Mikasa’s aborted concept). A(5/5): Regardless of income, we adress old premiums, just like other ships. If you check the change logs over a year, you will see it. However, both Aurora and Yubari, to be honest, are not in bad spot, so…it’s not justified now. A(1/13): No, and we don’t think it is currently needed – in current meta. Q(2/13): Are you happy with legendary modules for T10? Are changes planed to them? A(2/13): Yes, although, the amount is data is not good enough yet. No plans to change them. A(3/13): No, because, due to the nature of these marks and the gameplay, they will be barely visible even on player’s ship – it’s just does not seem to be worthy. Q(4/13): Are you happy with the current implementation of Akizuki-Harugumo? Especially their high penetration of HE? A(4/13): For now, given the amount of data – yes. Q(5/13): What is the stand of BB AP against DDs? Somewhere I read that currently the Dev Team is testing their third solution? Q(6/13): How happy are the Devs with the current ranked season? Is it to early, because not enough data yet? A(6/13): TBH, I did not looked into it yet – was busy with all these announcements. I will ping the team about it. A(7/13): Yes, but it’s not the burning priority. Q(8/13): You introduced the spotting ribbon. Are you happy with the current implementation? Q(9/13): Are you happy with Z-52? A(9/13): We are happy with it, and the radar itself is being addressed separately. Q(10/13): Are you happy with Worcester? Especially her ability to stealth radar and great HE DPM seem to be really broken in some cases. A(10/13): In some cases is the point. It has a lot of weaknesses to compensate, and it’s too early to call for nerf in our opinion. Q(11/13): Is there a bug with torpedo tubes of YY? A(11/13): I will check with the team – I am not aware of it. Q(12/13): Will AA focused ships like Kidd or Atlanta lose their advantage? A(12/13): It’s yet to be seen, and surely within CV rework we on the contrary want AA ships to have this advantage. Q(13/13): My friend as a cv main is feared, because he won’t be able to do 300k in an extraordinairy round in his cv after the rework. He understand the rework as major nerf to the whole class. What do you say to those fears? A(13/13): It may be a nerf for your friend indeed, but as Spock said, the needs of the many outweigh the need of the few (or was it Han Solo? Or Mal Raynolds?). Question: Server preformance through the recent months has been underwhelming for many players. While desync has become a more frequent problem lately. (Yet very rarely on PTS) Many players attribute these issues to the engine. Imo issues are likely server-sided. Do you know (and can you disclose) why these issues happen more often in recent times? Does the PTS have (as I suspect) a higher tickrate? And couldn’t that be implemented on live server, too? Answer: Hey, please, give me more context (‘many players’ is not proper context). What server are you from, from where do you play, what ping, what issues, etc? Because overall, I don’t see any decline in server performance, and any raise of support tickets over it. Question: Mikhail Kutuzov: I don’t really understand why she still remains in the permanently unavailable pool? Answer: I honestly don’t know, but you’re raising the right question IMO. Right now we technically can do anything with any ship, but the community is used to “prems are not directly nerfed” unwritten rule. This principle has some good AND bad things about it. There are several ships, that we’d rather address and slightly tweak – including MK, but we’re not doing it right now, because this question is still open and we’re discussing it, trying to find the best way to deal with such cases. Thanks for raising it once more, as it just shows me the importance of this issue. Q(1/3): Is it possible to add to the arsenal for purchase the ship specific flags usually only available in the most expensive bundles. This would be great for people who got premium ships from super containers or who could only afford the base pack when the ship first went on sale. A(1/3): Yes, but why would we make our top bundles less attractive? To make the game less economically viable? Sorry, but it’s not happening – these are purely cosmetic, and do not prevent anyone from enjoying the game. Q(2/3): Is WG considering more ways to earn steel outside of ranked and clan wars? With the T10 legendary module missions its proven long term, very grinding tasks can be set to earn rare/interesting items. Q(3/3): I made a thread a few weeks ago regarding some potential ideas to improve the way the main guns operate which was very well received. A(3/3): That’s a good feature in general, but if we really compare the amount of situations where players will use it consciously (and the amount of such players) with the resources to implement it (mess with game logic, also requires UI support)..it’s just not worth it. Sorry. Q(1/6): Pensacola and Myoko have 45 second turret traverse. Playing cruisers with turret traverse worse than a lot of battleships is quite rough. Turret traverse buff please? A(1/6): Yes, it’s rough, but it is their trade off for the salvo of 203 mm shells on their tier. Additionally, Pensacola has improved bounce angles, and Myoko has good HE. So, no buff is planned here. Q(2/6): USN T6 DD Farragut only has 11,500 HP, which is 2600 less than Mahan (T7) and 1600 less than Nicholas (T5). Farragut’s premium sister ship, Monaghan, has 2400 HP. Could the ship get a bit more HP please? A(2/6): The suggestions SOUNDS ok, but Farragut is in good spot among T6 DDs atm – so I really don’t know WHY do it? Q(3/6): All T7 DDs, except for Gadjah Madah and Haida have significantly worse concealment than T5, T6, T8, and T9 DDs. […] Is the worse concealment at T7 intended? A(3/6): Yes, it is, as a part of tier progression, and it’s not only about DDs. Q(4/6): With the addition of Henri IV, Kronstadt, Stalingrad, and the upcoming Alaska there is an increasing problem with Royal Navy light cruisers. […] Any chance we could see Neptune getting a smoke firing buff and maybe a 25mm bow (but not stern) on Minotaur and Neptune? A(4/6): Yes, Neptune and Mino are easier to counter now, which is fine, as well as their performance. There is no reason to buff them. Q(5/6): Kitakaze and Harugumo are just not fun at all to play against in any ship. […] Can they please be nerfed in some way? A(5/6): Let the stats stablize, and somewhere around 0.7.11 we will revisit them. If they’re really too much, we can always tweak them (e.g. set penetration to 1/5 and remove 32mm pens), but right now it’s premature, as the playerbase of the ships is not stable enough. Q(6/6): Can next ranked season please be something other than T10? Q(2/10): Are the devs satisfied with how ranked battles are working currently, and are there plans to address the “save a star”-mechanic, which receives more and more criticism the more and more seasons there are? A(2/10): We really are. As I commented before, we don’t claim they are perfect – surely no – but they are established, proven mode with a strong fanbase. They do generate extra salt, but tbh, almost any ranked mode with random MM in any game is doing that. We will lool for various improvements, but I really doubt there will be dramatic changes soon. Q(3/10): Arsenal. Two questions regarding that: 1) will it be possible to use a hybrid of coal and FXP to purchase FXP ships? 2) will there be a rotation/extension of coal-ships in the future (I’m thinking Duke of York, Indianapolis, Varyag, Nelson. All ships that were either reward, or FXP). A(3/10): Arsenal: no; maybe yes, but we don’t want to remove ships unless neccessary. Q(4/10): What is the thought-train behind the “avant premiere releasing” of the T5-8 British DD’s (or French BB’s) using an RNG based mechanic of crates that may/may not drop a mission, instead of using the “guaranteed reward” from a mission-chain like was done for the British BB’s? Q(5/10): Can we expect more “views from the internal kitchen” from the St.Petersburg office? Stuff like how the team creates a fictitious ship (genre Conqueror, Zao, Grosser Curryvurst) from the initial drafts to the final product. A(5/10): I think so. I will talk to our glorious content queen Val about that, and she will check if it’s viable. Although I’m pretty sure we did it – not in video form, but withing several articles. Q(6/10): Camouflages: why does WG stick to the principle of “if you want the benefits, one has to look at it as well” for some of the more atrocious non-historical camo’s and reskins of ships? There are complaints about such stuff breaking the immersion in the game. Can we expect a filter that allows us to use the camouflage/reskin, but have it replaced by the looks of a Type1,2,5 camouflage? A(6/10): Because introducing eh…transmogrification to WoWS sounds really cool, but it IS actually a rather costly feature, at the same time not widely requested. Q(7/10): Camouflages: can we expect premium camouflages (for premium or techtree ships) that give anything else in bonusses than the standard +50XP, -3% detect, +4% dispersion, -10% repair costs? Stuff like the Tirpitz/Eugen camouflages, or some of the Kobayashi-ones. A(7/10): We don’t have any taboo on that, but try to be careful so that current prem camos owners do not get angry. Q(8/10): Collaborations: without giving any concrete information, are there collaborations planned in the future for which there is already an agreement (so “virtually guaranteed it will come to WoWS”)? Q(9/10): Will further cosmetic personalisations come to WoWS? I’m thinking like an equivalent of “marks of excellence” in WoT, but then to ships: small items (flags?) that can be used to display a sheer dedication/experience to playing a ship. A(9/10): We worked on this, but they are not really viable. Even on player’s ship they are too difficult to notice. So, this will be mostly waste of time. Q(10/10): Can we expect “national flag-coloured” background shields for the patches? Instead of the monochrome blue/green/red/white/… shields, that the shields display the flag of a country. Q(1/5): regarding initial ship balancing, where do you start? some companies start with things being OP, and then reigning them in (UBI and R6S come to mind) . do you maybe just fill historical parts then fill in the blanks? A(1/5): We start from the stats mostly calculated based on IRL specs, then assign the rest (if they cannot be properly calculated), then do initial internal balancing, then it all depends on testing. Our mission is to find the sweet spot. But it’s hard as hell, tbh. This is why some lines come overbuffed (and ppl whine that we’re greedy bastards who just want to have money) and some come underbuffed (and ppl claim that we don’t want them to have fun with new ships, and – which I particulary like – that new ships are an insult to them all). This is rough. Because our game is not simple, and meta is not simple, so finding this sweet spot on release is a challenge. But we do our best. Q(2/5): With the CV rework incoming, Capt. skills are bound to change. Is WG planning on looking a the rest of the skills? any stern looks at IFHE? Q(3/5): How is Stalingrad performing in relation to what was expected? A(3/5): It’s surely higher in avg, which is totally exptected due to the player base. In a month or so, we will do research on her owners’ stats with her and other ships and will be able to draw some conclusions. Q(4/5): What is the policy regarding Stalingrad in the case of overperformance? Question: […] Bismarck has a 320mm thick belt whereas Tirpitz has a 315mm belt. In all historic documents about the two ships I have seen so far, both ships had an armour belt of 320mm thickness.So my question is, is this just a typo ingame or is it based on history? Question: I do not know if this is still on .. but one question regarding Arms Race – is it intentional that legendary modules cannot be grinded in this mode ? Answer: Yes, but not because we want to be fun police. Problem is, Arms Race is an experimental mode, and providing full server-side event support for it is currently not feasible, while we still don’t know if you guys will really want to play it constantly. Especially for the ongoing events. So for now it indeed is stripped of such events, but we’re determined to change that with time. Question: Is there any chance of the USS Missouri coming back, but with reduced profitability putting it in-line with the Musashi/Kronstadt? I feel like this could be workable if the current level of profitability were tied to a skin/camo that only the current owners would be given; unless of course there are other reasons beyond the amount of credits it makes WG would not want to make it available again? Answer: It’s not about profits, it’s about her battle influence. Q(1/2): My first question has to do with captain customization- or lack thereof. Why is World of Warships lacking in the ability to manually select your commander’s portrait, first name, and last name, as in World of Tanks? Or retraining a commander to a Premium ship, if you so choose? A(1/2): These are indeed nice features, but they are not widely requested and they do not affect the game in a meaningful way, so their priority is extremely low, tbh. UI team is quite loaded, and you probably know we have bigger issues with UI, including port. We try to load them with only the most important features and improvements. Q(2/2): My second question now has to do with balancing an older ship of the game- I may be a little biased in this case, but I’d like to talk about balancing Torpedo Protection of the tier X battleships- specifically Großer Kurfürst. I feel that when you compare the GK to the other tier X’s, she doesn’t offer anything that would justify her torpedo defense being so poor when compared to her contemporaries. A(2/2): Her citadel protection is still the best (it’s totally not nullified, only Conqueror is close in terms of cit hits received), and she has viable secondaries. Also she has HAS and the good HE protection to help her in CQC. As for the torpedo protection, its stats is calculated based on the construction, and we avoid tweaking it when we can (as well as armor). Question: So hey, looking at the charts it appears that the Yorck, with its buffed AP, now outperforms the Hipper in some ways or at least matches the ship a tier up? […] What I’m saying is, any chance Hipper’s guns can be made better than or at least equal to Yorck’s in all circumstances? Answer: Looking at charts I can confirm that with both median and avg damage stats Hipper outperforms Yorck by ~10% and is okay within the group. I will ask GD team to look into the ship more, though, it won’t hurt checking 🙂 Also, please mind, while he’s not the best at raw DPM, he has very good survivability. Question: OP there is concerned about Alaska being a steel ship. Does the Steel ships representing drydocks 4 and 6 mean anything or is OP reading too much into that? Question: Would it be possible for a CV carrier to switch to old control for CV if they don’t like the rework? Answer: While we still don’t know how the rework will effectively go (because the public test has not started yet), I’m pretty sure switching between RTS controls and Action controls is both extremely difficult and unnecessary. As for the ships themselves – don’t worry, with the rework, all CVs are going to be rebalanced anyways, and there are a lot to play with, including plane stats, squadron and wing size, and available payload. Question: Why does WG not announce how a ship will be distributed until the ship is about to be released? Question: Are the moving storms introduced in Operation Hermes (and further continued on during the Space Battles) going to be further worked on/introduced into random battles, or are they going to just be specific to Hermes and future events? Answer: We’re working on introducing them to PvP as a small portion of new experience, that’s right 🙂 I mean, we have 2 types of gameplay affecting weather – Cyclone (map wise) in PvP and Thunder Storm (local) in PvE. With some tweaking, Thunder Storm will be introduced to PvP with low frequency. Cyclone will probably stick around too. Overall, there should not be dramatic increase in “weather games” number, but the diversity of gameplay will be increased. Question: Could you guys tell us the exact ending date for each collaboration (according to the contract) right from the start of that collab? The HSF collab has ended recently and while we knew it would end some time during the later half of this year, we didn’t know exactly how much time we had until the 0.7.9 patch note hit. Answer: While I understand your position perfectly, usually it’s not possible. We’re talking about 3rd party licensing here, and very often we ourselves do not know whether we can/will renew the collaboration, prolong it, or will have to stop it at earliest possible date. We don’t feel we can disclose such details, and provide players with reliable time frame from the very start.